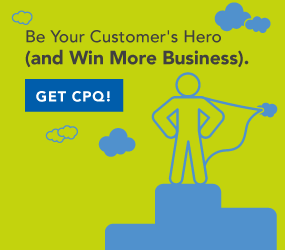 Configure-Price-Quote (CPQ) software helps keep the sales conversation alive and focused on the needs of the customer. You can’t depend on a goal-driven, unstructured conversation to get that done. Much has been written about the value of listening in the process of marketing or selling, and configure price quote software assists in the conversation. Sales transactions, in fact, do involve at least two entities, typically a buyer and a seller, with the transaction itself being conducted via communication between the two. Too often, we marketers and likely sales folks as well, spend too much time on the outbound side of the communication equation and not enough time on the listening side. This has to be frustrating for buyers. toward identification and specifications of the perfect solution for the customer. They do this by “remembering” all of the right questions and making sure the answers are provided by the prospect to cover all of the details needed to identify a solution. If you sell hammers, your job is somewhat easier than the fellow who sells tools. Hammers do one thing, and your conversation is essentially centered on finding out if the prospect has any nails that need hammering. A tool sale is more complex. The sales rep has a whole workshop full of options. Tools that saw, cut, pry, turn and fasten in a variety of ways. The prospect has a need of some undefined sort, so the conversation is naturally going to focus on learning about that need. Configure price quote software is driven by on-screen sales scripts that are specifically designed to accurately and fully reveal those needs and queue up configuration options based on the specific needs revealed through the script-driven questions. This also allows scripts to help determine if the needed functionality is not within the capability of the product. The sales rep and the prospect engage with one another across a desk or over the phone. The sales reps tells the prospect that he needs to ask a few questions to see how they might address the prospect’s needs. The prospect agrees and tells the rep to proceed. Sales Rep: So, before we talk about what tools would serve your needs, tell me what kind of work you are doing? Prospect: I need to cut a bunch of stuff down to smaller sizes. Sales Rep: I see, it sounds like a cutting tool might be what you are looking for. We have knives, scissors and we have saws. Can you tell me a bit more about your job, what are you needing to cut? Prospect: Well, I have a bunch of wooden boards that are too long to use. By asking about the type of work to be done, the rep is engaging the prospect to provide more information. The rep doesn’t have to guess. More importantly, the prospect supplies the critical information that allows them to make the initial selection within the Configure Price Quote software solution. The operative word is “cut,” and the nature of the cutting to be done eliminates a slew of possible options. He’s cutting wood, not masonry, steel or plastic pipe. The buyer volunteered “wood” in his previous comment, and the rep picked up on that. If he had not, the software-driven script would have a question, “What is the material to be cut?” and that means the rep doesn’t have to remember to ask it. The sales script drives the conversation forward in a definite direction. We know that the basic technology needed is a saw. The question still remains, what type of saw? Sales Rep: Okay, now we’re getting somewhere. We have a superb set of handsaws that will make short work of cutting wood. We also have a full line of power saws for wood projects. Prospect: Wow, sawing all of that by hand would be a lot of work. Sales Rep: No problem, how much wood do you have to cut? Do you do this often? Prospect: I have about 50 2x4s I need to cut this time. I usually have to cut lumber about three times per month. Sales Rep: It definitely sounds like you are needing a power saw with that kind of volume. Reps who are focused on simply closing a deal or moving product are going to be tempted to just tell the prospect that they have the best handsaws in the business and then push the prospect to close. The prospect will either bolt thinking there are no other alternatives or settle for the choice that only partially meets their needs. At best, this will either end the engagement without a sale, or it will produce a sale that creates an unhappy customer in the future when they get sick of hand sawing wood. Happily our rep is powered by Configure Price Quote software driven by a sales script. The prospect has more to say. Prospect: Yep, a power saw would do the job. Sales Rep: Are you just sawing things down to size, or do you have angles and other technical requirements when you saw? Prospect: Oh sure, we cut notches, angles, radius corners and all sorts of things to make the pieces match the job to be done. Sales Rep: Okay, if you are just cutting some angles, I would use a miter saw. It’s fast and easy and adjustable to over 180 degrees for angle cuts. But, if you are needing small precision notches cut, you might want to consider a table saw with a band blade. Prospect:Is there one option that would do both? Sales Rep: The table saw with the band blade will handle both simple and complex cuts. Prospect: The band saw sounds like the best option. What about price? The discussion has now covered almost every imaginable variable related to this prospect’s needs. A specific product has been identified as the best choice. The prospect suggests that their decision is made, but then pricing comes up. This is where great salespeople make the difference. Sales Rep: The band saw does cost about 20% more than the miter saw, but, it does everything you need while the miter saw does not. Prospect: Okay! Wrap it up. I’ll take the table saw and band blade option. There may not always be a choice at the conclusion of the scripting questionnaire. And, as indicated previously, the questions and answers may reveal that you do not have a solution. Both outcomes are good in that they serve the best interest of the customer. While it may seem like you need sales reps with the domain expertise and knowledge to cover the interview, the reality is that for many highly configurable products, there may not be any—or at least a precious few—sales reps who qualify for that job. And, if they do qualify from a knowledge standpoint, perhaps they are better suited in product management or support. Another factor is the tendency for humans to develop favorites. We all do it—we get comfortable using a hammer and before long the hammer is also a wrench, a screwdriver and perhaps even a saw. Finally, the fact is, you want consistent application of your selection knowledge and criteria. Two reps listening to the same interview will likely hear things a bit differently. Rep 1 may feel that the customer clearly needs option B, while rep 2 may see it differently. Rep 2 may see it as option C. Configure Price Quote software can make the difference. Inconsistency can lead to problems when things go wrong in a damaging way. If your recommendations differ, you may open the door to liability in terms of inconsistently applying a solution to a problem. Sales scripts, driven by the CPQ software, eliminate the omission that kills the deal. They apply your application and domain expertise consistently and correctly. They prevent the bad deals that kill the relationship, and they boost the level of confidence the prospect has in you to fulfill their needs.